1. Preheat a grill to medium high. Brush the chile pepper with 1 teaspoon olive oil and grill, skin-side down, until charred but still firm, about 5 minutes. Cool slightly; peel and finely chop. 2. If using fresh corn, bring a small pot of salted water to a boil. Add the corn and cook until tender, 2 to 3 minutes; drain. 3. 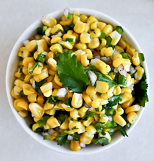 Mix the corn (if using frozen, add it here), chile, jalapeno, cilantro and red onion in a bowl. Stir in the remaining 2 teaspoons olive oil, the lime juice, sugar and 1/2 teaspoon salt.